The 1980’s seems not so far in the past to the memories of a good deal of people. However the truth of the matter is that it has been thirty years since that time period. Decorating and designing the house in a 1980’s style is officially considered to be retro. 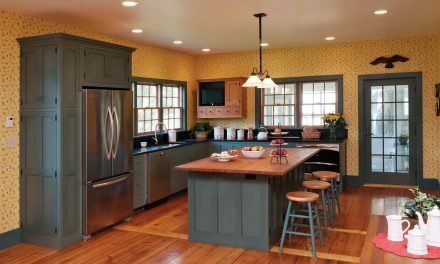 Decorating trends from that time period are mostly considered to be out of date, yet certain aspects of 1980’s decorations are still popular today. One of these popular trends is the use of an antique mirrored furniture style called Art Deco. Contributing to your house’s interior design with popular 1980’s style furniture, you can significantly improve the style and attractiveness of the overall decor. Just as history repeats itself, previous fashion and decorating concepts also become new again. Just as you can take ideas from the 1980’s to make your house attractive, so did designers in the 1980’s take concepts and art deco designs of the 20s for inspiration. To add Art Deco mirrored furniture to your house is to add style and a unique retro attractiveness to your rooms. This style is considered to have clean, strong lines which make a significant statement. A good deal of these pieces feature mirrored and glass surfaces, which can make a room bright and appealing. Some have elaborate designs, geometric patterns that can elegantly set the central theme of the room’s design. 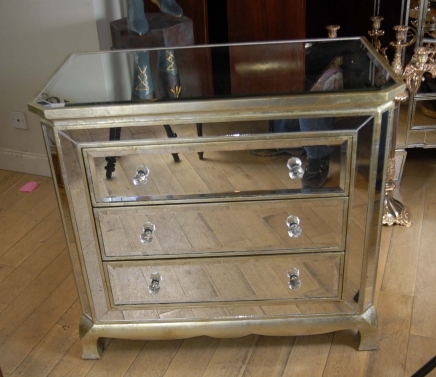 For instance, a mirrored chest of drawers featuring glass paneling cut our in geometric designs can be used as a central motif while arranging additional items that have complementary designs and patterns such as rugs, curtains, and fabric lighting fittings. Another good thing about purchasing retro furniture is that you can usually find them on sale and with a low price tag in second hand shops. However, an online source can always provide a large inventory and selection of mirrored furniture. Many manufacturers today are still offering furnishing lines that are styled after the 1980’s art deco designs. Designing your house with furniture that features mirrors is a wonderful way you can transform your home to have a fashionable retro feel. 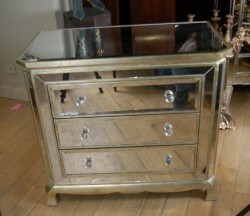 Mirrored furniture has long been popular and will remain so for many more years. Mirror covered furniture can be absolutely gorgeous if done right. Many times just one nice accent piece will have the ability to transform the look and feel of an entire room. Adding too many pieces, especially in a small room, may prove to be too much.